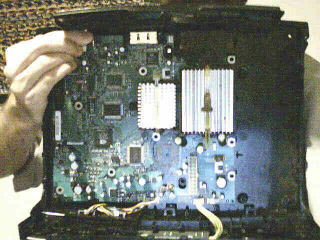 So here I am with an Xbox motherboard with the bottom plastic case and power/eject buttons. Now what? I have no idea that this is a working Xbox motherboard, so the first order of business is to find a way to supply power to it (freely, because I'm the cheapest guy alive). The thread goes on to say that R3 should be ommitted and R4 should be changed from 4.7kOhm to 1kOhm. 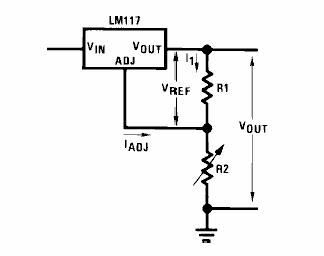 Using this diagram, R1 is 240Ohm and R2 is 390Ohm. Try and get values as close to these as possible. As it turns out, yes, it does do that. I discovered that the Xbox will boot with a flashing orange LED if the A/V cable is not hooked up. Seeing as how I don't have an A/V cable, this was a problem. we need to see something! I'm feeling good at this point because I have an Xbox capable of thought (in so far as being smart enough to flash orange at me without an A/V cable). My next task was to find a pinout of the A/V port at the back of the motherboard, and as luck would have it, I found exactly that. 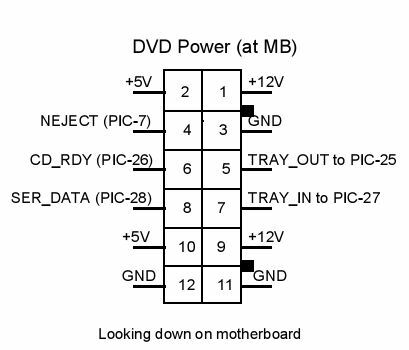 I managed to find a description of the Xbox A/V connector on the underside of the motherboard. 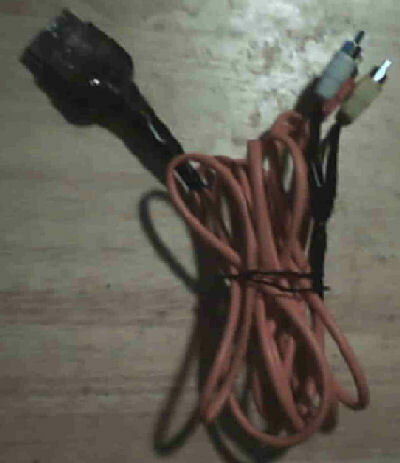 The Xbox is able to complain about no cable connected because the cable grounds the proper mode select pins, so they need to be grounded along with attaching audio/video cables. 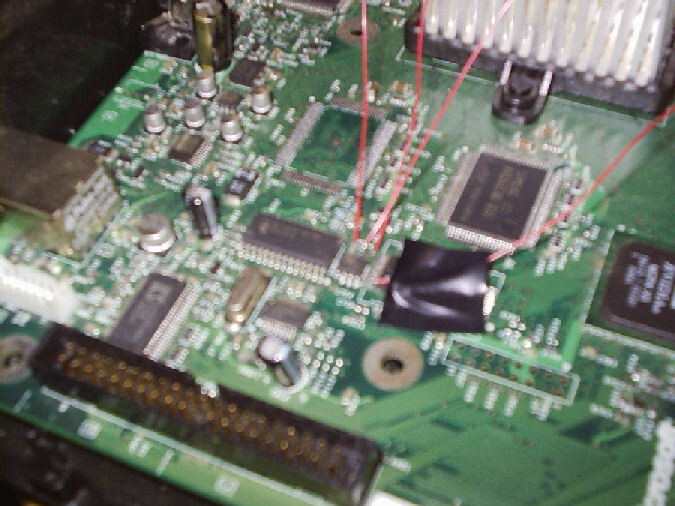 I soldered a wire connecting pin 19 and one of the grounding pins so that it would think an NTSC mono cable was attached. Then I was able to get a video signal and the left audio channel. Panic ensues, but not too badly since I've yet to hook up a DVD drive or hard drive. so what does this thing want from me? Once I got that out of the way, I hooked up an old 10GB hard drive and a broken (meaning it can't burn) DVD burner via IDE cable and the ATX power supply. After that, the error code changed to one meaning the hard drive was unlocked. What's this? Hard drive unlocked? After a whole lot more reading, I discovered that the hard drive which comes with the Xbox is "locked" to that particular Xbox. Since I have no idea where this motherboard came from, I have to figure out a way to "lock" my own drive so that my Xbox will like it. 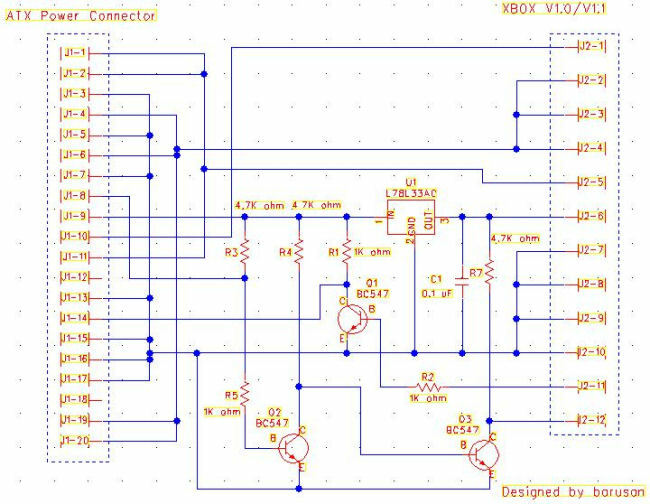 Unfortunately, the Xbox generates the lock/unlock key from information in its EEPROM, and without a modchip, there is no way to get at this information or boot the Xbox...almost. What came next was a real mess. 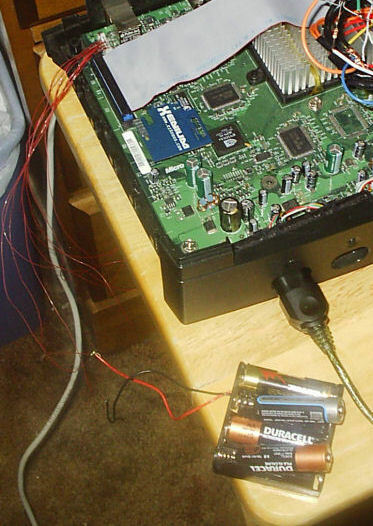 I had to use a program called xboxhd to use my PC to lock the hard drive. I also found out that the hard drive I was trying to use couldn't be locked. So after going insane trying every hard drive I owned and every PC I had to get this frigging thing to lock, I finally found a 13.6GB drive and a frustratingly-crappy PC which worked. 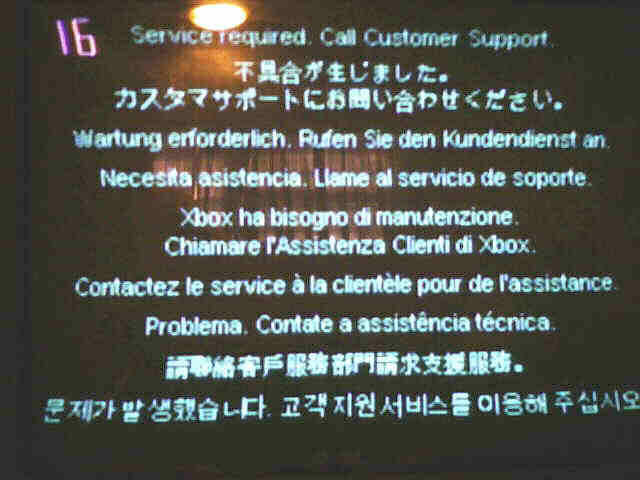 So I have a functioning Xbox happy with the hard drive and DVD drive...I turn it on and I get another error code. Now what? great, NOW what does it want? After that, it booted Evolution-X quite happily! I *cough* acquired *cough* some games and tried them from within Evolution-X (the first being Burnout 3: Takedown), but they didn't seem to work. Evolution-X kept saying the DVD drive tray was open, even though it wasn't. What? What's this? Pull the batteries out to "eject" the tray, and insert them to push the tray in. Incredibly crude, I know, but it's cooler that way. wacky, but does it work now? Yes! It worked perfectly! Yay! 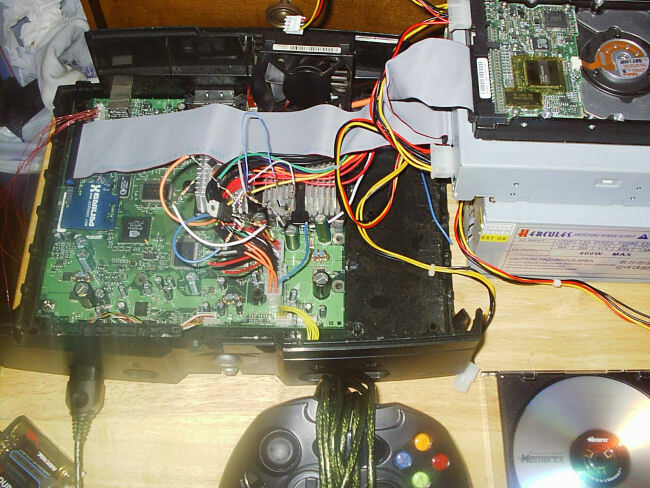 A working Xbox from (almost) nothing! At this point, I went crazy playing games. Lots of games. All that's left is to put it in a real case. It obviously can't fit since it uses a micro-ATX power supply among other things, so I intend to build a case. When that's done, pictures will go up and this project will be officially complete. I hope the information here is of some help to somebody, or at least entertains them. Feel free to e-mail me if you have any questions about it all.